Is your Acura suffering from unsightly dings or dents? If so, don’t take it to a repair shop – Paintless Dent Repair (PDR) is a faster and more effective way of fixing your vehicle. Paintless Dent Repair is a technique that removes dented panels from behind, then uses special tools to carefully massage the dent back into place. This is the same technique that dealerships often use on their lots to fix vehicles that have suffered dents before sale. Aside from being an effective way of getting rid of dents, this process also allows for repairs that don’t require strange bonding agents, weird chemicals, or a new coat of paint. PDR helps dents look like they were never even there. PDR’s tools are small enough to move around. Here at EZ Dent, based in Athens, GA, we believe that getting something as small as a dent fixed shouldn’t require you to spend the time (or the money) that a full body shop requires. Instead, we’ll use proven, non-chemical techniques to repair your Acura quickly and effectively on a flexible schedule. How Fast Can You Fix My Acura? That depends on a variety of factors, including how many dents you have, how large they are, and where on your vehicle they’re located. On average, though, repairs are done in one hour or less. The speed and accuracy of PDR also allows us to offer you a price that’s well below what a body shop would charge for the same repair. *Disclaimer – EZ Dent is not officially affiliated with Acura or authorized Acura dealerships. 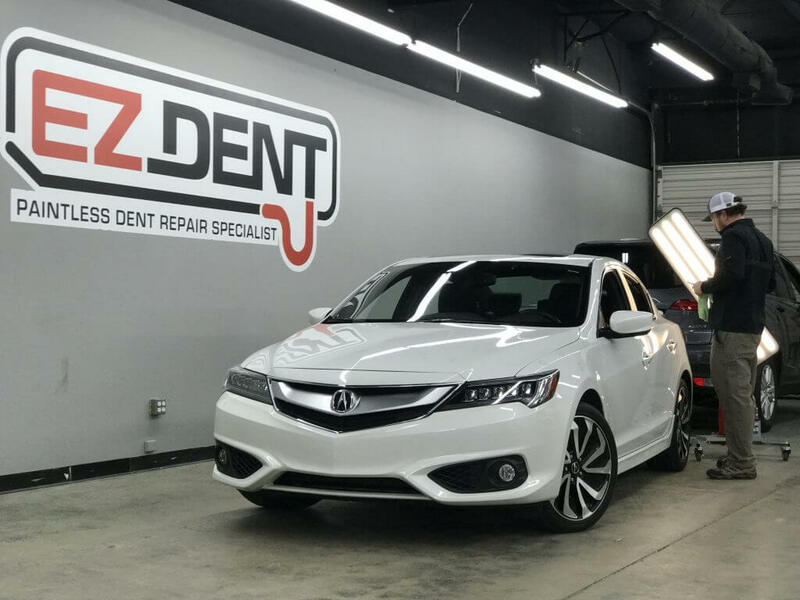 To get more information about Paintless Dent Repair, or to schedule an appointment and have your Acura start looking like new again, contact EZ Dent today.